Hey Y'all.. 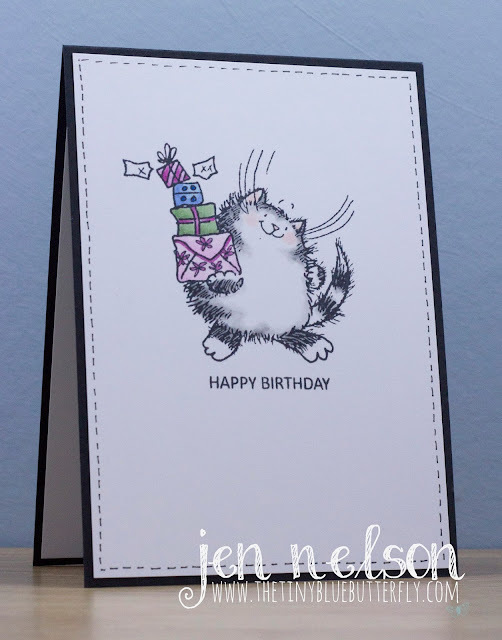 I'm back today with a little simple card using Penny Black stamps. I have so many of the cute Margaret Sherry images that I thought I better start making some cards using them! I think that even if I didn't buy another stamp I could use a different image daily for about 5 years .... better start shopping my stash for a while.. or crafting some more! I stamped the kitty image from Happy Times set and then coloured her in with Copics. I added a little bit of wink of stella to the presents and then added some pen drawn faux stitching around the card panel. The sentiment is from Tiny Type from Clearly besotted. This is definitely one of the best simple sentiment sets that you must own! Finally I mounted it onto a black card base and added an insert.